Grave Creek Mound on the Ohio River, at 40oN, tells both the story of the Egyptian discovery of America during the Old Kingdom, and the metal trade during the Empire of Atlantis (2500-1200 BC).43 However, it also tells the account of the Dardanus Flood during the reign of the 2nd king Ramses III of the 20th Dynasty. It was caused by a Comet Catastrophe, and it lasted 40 + 40 = 80 days. 6 million people perished (32%). The precipitation was 5.5 meters of water. Four centuries of cold and dry weather followed. The Grave Creek Tablet is engraved with Punic script from SW Iberia. It provides an accurate date of the Mound: the 24th Dynasty of Egypt (c.727-715 BC). It confirms the metal trade across the Ocean during the Empire of Atlantis. 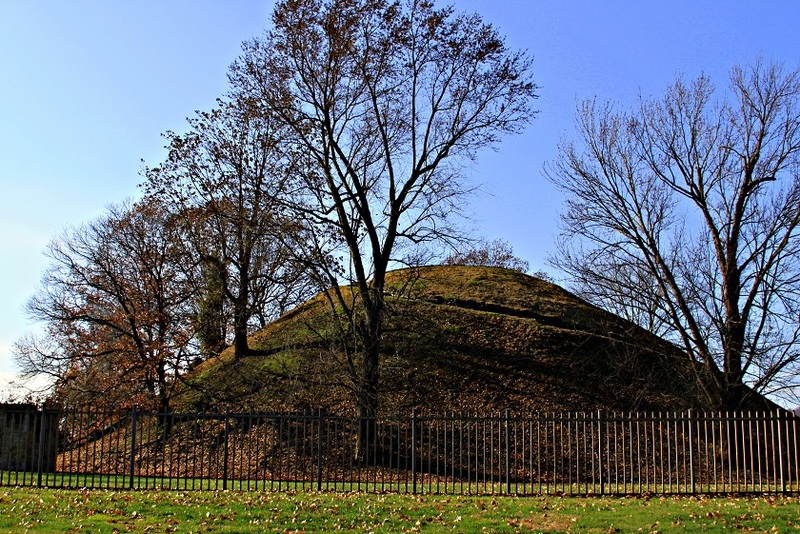 Grave Creek Mound is one of the largest conical type burial mounds of the US. It is located in Moundville, West Virginia, a town of 10,000 inhabitants on the east bank of the Ohio River. The Mound has a height of 19 meters and a base diameter of 73 m. On top is a circular platform with a diameter of 15 m. Originally the Mound was encircled by a moat, having a width of 12 m and a maximum depth of 1.5 m, with one causeway across it. The shortest distance to the Ohio River, having a local width of 220 m, is 670 m. The shortest distances to both Big Grave Creek in the south (width of 16 m), and Little Grave Creek in the north is 1100 m. The Mound is located at 40°N and 80.7oW. In 1838 the Mound was excavated by amateurs. Right below the center of the mound a rectangular vault was discovered just below ground level, containing two skeletons. It was oriented north-south, and it had a length of 3.7 m, a width of 2.4 m, and a height of 2.1 m. One of the skeletons was surrounded by many beads and an ornament, both of sea shell. In the center and about halfway the height of the Mound a second and similar vault was discovered, which contained a single, large skeleton. It measured 2.24 meters, and was oriented east-west. The skeleton was surrounded by far more beads of sea shell, a lot of complete sea shells, and many square pieces of mica, with two or three little holes in them. Five copper bracelets were found around its wrist bones, weighing together 480 g (17 ounces). Although the Mound is made of the same dirt as present in the immediate viscinity, the color of it is a kind of blue, probably due to mixing with some unknown copper compound. 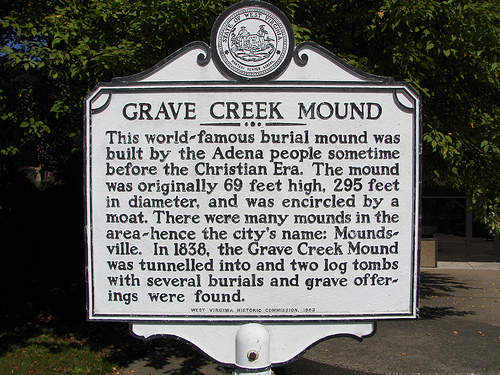 Grave Creek Mound is dated by most professional archaeologists to c.250-150 BC. It was declared a National Historic Landmark in 1964. The Biblical Flood occurred at the start of the Sixth Dynasty, c.2344 BC (tree ring dating). It ended all ancient civilizations on Earth, including the Old Kingdom. The Catastrophe was caused by a Comet with a periodicity of 575 years. The archaeological site of Poverty Point, NE Louisiana, is located on the average latitude of the islands of Madeira and Bermuda in the Ocean, at (33o + 32o)/2 = 32.5oN. The complementary latitude of 90o - 32.5o = 57.5oN shows the periodicity of this Comet: 575 years. In the Old World latitudes were already known 4800 BC. In antiquity the Head of a Comet was symbolized by the island of Greenland, consisting of ice and stones. The Tail of a Comet was symbolized by the North Atlantic Ocean below it, which contains a huge amount of water. Cape Farvel, the south cape of Greenland, is located at 60oN, which is 60o - 40o = 20o above Grave Creek Mound, indicating the 20th Dynasty, when the Dardanus Flood occurred. Cape Chidley, Canada, is located at the same latitude, confirming it. The south coast of Cuba, at 40o/2 = 20oN, confirms it, too. The meridian of the Mound hits the north coast of Cuba at the latitude of the holy Tropic of Cancer, at 23oN. At midsummer day the Sun is there at right angles above. The slow northerly movement of the Sun turns into a southerly movement. So, people believe in the Egyptian SunGod Ra! (Sun religion) – The north coast of Cuba, at 20o + 3o = 23oN, encodes the 2nd king Ramses III (1184-1153 BC) of the 20th Dynasty. The Disaster happened at the end of his reign, in 1159 BC. The meridian touches the south coast of Lake Erie, 42o - 40o = 2o to the north. The Ohio River flows to its confluence with the Mississippi River, 40o - 37o = 3o to the south-west. It confirms the 2nd king Ramses III. The local width of the Ohio River is 220 m, or 2 millimoiras, and the meridian runs across the Kanawha River, or New River, 40o - 37o = 3o below the Mound, confirming it. The northern Nile Delta is located at 31oN, confirming his 31 years of reign. The meridian of the Mound passes the Isthmus of Panama, 40o - 9o = 31o to the south, confirming it, again. All mentioned encodings of the number ‘two’ show it was the second big Calamity in the history of Atlantis (which consists of Egypt and the America’s). The three degrees below the Mound correspond twice with the latitudes of the three island groups of the Azores: the East, Central, and West Azores. These all show this Catastrophe happened at the end of the third time period of good government of Egypt, which was the New Kingdom. The Old Kingdom and the Middle Kingdom were the previous time periods when civilization in Egypt (Atlantis) flourished. The two vaults of Grave Creek Mound indicate the Comet Catastrophe was a two stage event, just like the Biblical Flood. The other encodings of the number ‘two’ confirm it. The Delta’s of the Nile and Mississippi Rivers are located at 30°N. These correspond to the 30 days of the month. So, the duration of the Disaster is expressed in days. The 40th latitude line at the Mound is the most famous one of North America, because it encodes the Egyptian discovery of the continent in the Fourth Dynasty. However, it also encodes the first time period of 40 days of the Dardanus Flood. The falling stones were causing horrible forest-fires, and the melting ice resulted in torrential rains and worldwide floodings. It was completely dark on Earth. The second time period lasted 40 days, too. The climate was completely disrupted. The terrible rains and floodings continued, but it also became very cold. So, the rains changed into ferrocious snow and hail storms. The meridian of the Mound leaves the coast of South Carolina 40o - 32o = 8o below the site, confirming the total duration of 80 days. It runs through the Isthmus of Panama at 9oN. The complementary latitude of 90o - 9o = c.80o confirms the duration of 40 + 40 = 80 days. Bermuda is located 40o - 32o = 8o below the 40th latitude line, confirming it, too. The Central Azores are located 38o - 30o = 8o above the Nile Delta, confirming it, again. The Central Azores consist of five islands, encoding the precipitation during the Dardanus Flood, 50 micromoiras = 50x0.11 = c.5.5 meters of water. The length of the 40th latitude line across the continent of North America equals 5 Moiras, or 50o, when measured along the equator, confirming it. The important line at the complementary latitude of the site, at 90o - 40o = 50oN, which runs along the northern shore of the Gulf of Saint Lawrence and beyond, confirms it, too. The distance from the Mound to the East Coast, at 40oN, is 5 moiras, or 5o, confirming it, again. Fig.2 Grave Creek Mound, dated to c.720 BC, is located in the town of Moundville, West Virginia, on the east bank of the Ohio River, at 40oN. The Azores in the middle of the Ocean are located at 38oN, encoding the 3.8 million casualties of the Flood. The meridian of Grave Creek Mound leaves the south coast of James Bay, at 52oN. The complementary latitude of 90o - 52o = 38oN confirms the number of victims. It hits the south coast of Baffin Island, at 70oN, referring to the 7 figures of the number. The diameter / height ratio of the Mound equals 73/19 = 3.8, confirming it, too. The south coast of Cuba, at 40o/2 = 20oN, shows the additional 2.0 million casualties because of system collapse (lack of government, wars). The meridian leaves the south coast of Panama, at 7oN, confirming the 7 figures of this number. The meridian touches the south coast of Lake Erie, 42o - 40o = 2o to the north, confirming the number of victims. The local width of the Ohio River is 220 m, or 2 millimoiras, confirming it, too. The island of Bermuda is located at 32oN. The complementary latitude of 90o - 32o = 58oN confirms the total number of casualties, 3.8 + 2.0 = 5.8 million men (32%). It is located 32o - 25o = 7o above the south cape of Florida, due south of the Mound, confirming the 7 figures of the number. Cape Farvel, the south cape of Greenland, at 60°N, encodes the approximate periodicity of the Comet: 600 years. The south cape of Florida, at 25oN, corrects it to the accurate value of 600 - 25 = 575 years. Note, that the peninsula of Florida has the shape of a Comet. Cape Farvel as well as Cape Chidley, Canada are located at 60oN, confirming the total number of casualties, c.6.0 million men. Grave Creek Mound is located 7 Moiras, or 70o due west of Iberia, when measured along the equator, confirming the 7 figures of this number. The length of the meridian of Cape Farvel on the Northern Hemisphere equals 180o, encoding the original world population before the Catastrophe, 18 million men. The "complementary latitude" of 180o - 60o = 120o corresponds to the number of survivors, 18 - 6 = 12 million men. The Azores are located 38o - 30o = 8o above the Nile Delta, confirming the 8 figures of this number. Grave Greek Mound is located at 40oN, encoding the c.4.0 million casualties of the Comet Catastrophe. The meridian leaves the south coast of Lake Erie 42o - 40o = 2o to the north, confirming the additional 2.0 million victims because of system collapse. The Mound is located 670 m, or 6 millimoiras, from the shore of the Ohio River, confirming the total number of c.6.0 million casualties. It is located 780 m, or 7 millimoiras, from the middle of the River, confirming the 7 figures of the number. Both the south coast of Lake Erie due north of the Mound and Cape Cod are located 60o - 42o = 18o below Cape Chidley, Canada, confirming the world population of 18 million people before the Catastrophe. Lake Erie is situated 42o - 30o = 12o above the south coast of the US, encoding the 12 million survivors. Most of them were seriously injured. Finally, Bermuda is located 40o - 32o = 8o below the 40th latitude line, confirming the 8 figures of this number. The meridian of Grave Creek Mound hits the north coast of Georgean Bay, 46o - 40o = 6o above the site, confirming the c.6.0 million casualties. It leaves the south coast of James Bay 52o - 40o = 12o to the north, confirming the 12 million survivors, most of them wounded. It leaves the south coast of Cuba 40o - 22o = 18o to the south, confirming the original world population of 18 million men. Finally, the south coast of the US is located at 30oN. The complementary latitude of 90o - 30o = 60oN encodes the c.6.0 million casualties of the Dardanus Flood. The south point of the Gulf of Campeche, Mexico, is located at 18oN, encoding the original world population before the Flood, 18 million men. It is located 30o - 18o = 12o below the south coast of the US, corresponding with the 12 million survivors. The Ohio River flows from Grave Creek Mound over three degrees of latitude to its confluence with the Mississippi River. It appears, that these three degrees encode the date of the monument: 3 dynasties after the 20th Dynasty of the Dardanus Flood. The Mound is located 40o - 9o = c.30o due north of the Isthmus of Panama, confirming it. So, apparently the monument was made in Dynasty 23 (c.818-715 BC). This Dynasty was very active in erecting sacred sites, because its number encodes the holy Tropic of Cancer, at 23oN. Far in the east it crosses the River Nile. It was the center of the Southern Egyptian Empire, but also the center of the Sun religion. 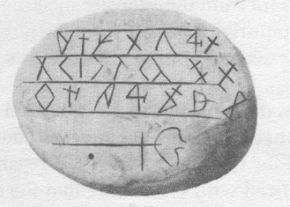 Fig.3 The Grave Creek Tablet, with Punic (Phoenician) script (c.720 BC). In the vault halfway the height of the Mound an engraved Tablet was found (see Fig.3). Dr. Barry Fell recognized the script as Punic (Phoenician), mainly in use in south-west Iberia during the first millennium BC. He translated the text, which was slightly improved by Mr. Donal Buchanan. When reading from right to left, as usual with this script, a slightly better version reads: "Burial Mound in honor of king Tadach. His wife caused this Tablet to be inscribed." This text confirms the burial mound is a king’s grave. Dr. Fell translated ‘His wife’ with ‘The Queen’, in agreement with this statement. We stated earlier that burial mounds were erected by foreign settlers from the Old World, and this Tablet proves it to be correct. Let us analyse this interesting Tablet further. The three lines of text illustrate the three time periods of good government of Egypt (Atlantis): the Old, Middle and New Kingdoms. It also shows Grave Creek Mound tells three important stories: the Egyptian discovery of America, the metal trade, and the Dardanus Flood, as shown in our two articles. Note, that the three lines of text contain 7,8 and 7 symbols, respectively. (The 3rd sign, counted from the right in 2nd line, is a single symbol). When consulting the history of Egypt, it turns out that Dynasty 22 had eight kings. The average number of symbols in the lines (7.3) is roughly in agreement with this number eight, and added together it results in the number 7 + 8 + 7 = 22. So, our conclusion is that Dynasty 22 (c.945-715 BC) was ‘history’ when the Tablet was made! Lower on the Stone is a vertical piece of line with at the right side of it the head of a bird. When reading the Tablet we have to look to the north, as usual. The bird is the symbol of the Egyptian king (substitute of God) at the other side of the Ocean (the vertical line), in the east where Egypt is located. The third line of the text represents Dynasty 22, with its many kings (see above). It became clear the tin trade was definitely finished, too. Contact between Bolivia and Egypt ceased to exist. The seven symbols confirm the millions of tin ingots, which were shipped across the Ocean to the Old World in the time period before it. (It also encodes the density of tin, 7 g/cm3; seven times heavier than water.) – The text in the next part is missing, because Dynasty 23 ruled simultaneously with the previous dynasty. It shows the United Egyptian Empire was falling apart in a Southern and a Northern Kingdom (Upper and Lower Egypt), as happened many times before. Both vaults of Grave Creek Mound have a length : width ratio of 3:2. It appears the two vaults are in honor of the 2nd king of the 20th Dynasty, when the Dardanus Flood occurred. The mentioned ratio might also be in honor of this 2nd king Ramses III, who was the pharaoh of Egypt during this horrible Comet Catastrophe. The skeleton in the upper vault was strewn with square pieces of mica, with two or three little holes in them. It appears king Tadach of the Old Copper Culture almost had the status of the 2nd king Ramses III of Egypt. – Note, that the platform on top of the Mound had two important meanings. First it was the home of the American king, where his palace should be built, far above his people. Second the king should always be protected against the danger of a Flood! The lower vault contained c.650 beads of sea shell, which might correspond to the c.641 years between the start of the First Dynasty (c.3105 BC) and halfway the Fifth Dynasty (c.2464 BC), when the copper trade possibly started. The upper vault contained c.1700 beads of sea shell, which might correspond to the number of years (c.1744) between halfway the Fifth Dynasty (c.2464 BC) and the death of the American king Tadach in Dynasty 24 (c.720 BC). This vault also contained c.500 sea shells, which might correspond to the number of years (c.534 years) between the start of the First Dynasty (c.3105 BC) and king Menkaure of the Fourth Dynasty, who discovered America (c.2571 BC). The upper Vault contained c.150 pieces of mica, which might correspond to the number of years (c.154) between the start of king Osorkon II of Dynasty 22 (c.874 BC) and the death of king Tadach of the Old Copper Culture (c.720 BC). The Grave Creek Tablet has a length : width ratio of 4:3. This ratio might illustrate king Tadach had strong ties with both Dynasties 23 and 24 of Egypt. – For sure it is possible that some of these relations do not exist at all. However, not looking at these and not mentioning them is no option, in my view. 1. Mills, W.C., "The Grave Creek Mound at Moundsville, W.V. ", Ancient American, Vol.16, No.95, 2012. 2. Gallagher, I.J., "Grave Creek Tablet is Genuine", Ancient American, Vol.12, No.78, 2008. 7. De Jonge, R.M., "The Discovery of Three Continents (Santo Stefano, North Sardinia, Italy, c.2300 BC)", Ancient American, Vol.12, No.76, pgs.28-29 (2007), Ref.5. 8. De Jonge, R.M., “The Mystic Symbol, mark of the Michigan Mound Builders” (2009), Ref.5, to be published. 9. De Jonge, R.M., “Houghton’s Petroglyph (Copper Country, Michigan, 2500-1200 BC)” (2009), Ref.5, to be published. 10. De Jonge, R.M., and Wakefield, J.S., "The Three Rivers Petroglyph, A Guidepost for River Travel in America", Migration & Diffusion, Vol.3, No.12, pgs.74-100 (2002), Ref.6. 11. De Jonge, R.M., and Wakefield, J.S., "A Nautical Center for Crossing the Ocean, America’s Stonehenge, New Hampshire, c.2200 BC", Migration & Diffusion, Vol.4, No.15, pgs.60-100 (2003), Ref.6. 12. De Jonge, R.M., "Tripod Rock, Pyramid Mountain (Morris County, New Jersey, c.1900 BC)" (2011), Refs.5,6, to be published. 13. De Jonge, R.M., "Gold Ring (Grand Canyon, Arizona, c.1450 BC)" (2010), Ref.5, to be published. 14. De Jonge, R.M., "Sentinel Rock, Vermont (Discovery of America and Biblical Flood, c.1900 BC)" (2011), Refs.5,6, to be published. 15. De Jonge, R.M., "Oil City Glyphs (Pennsylvania, c. 2000 BC)" (2012), Ref.5, to be published. 16. De Jonge, R.M., “The Battersea Shield (River Thames, London, c.190 BC)” (2009), Ref.5, to be published. 17. De Jonge, R.M., "Stonehenge, Monument for the Discovery of America (Salisbury Plain, South England, c.2000 BC)" (2011), Refs.5,6, to be published. 18. Peiser, B.J., Palmer, T., Bailey, M.E., Natural Catastrophes during Bronze Age Civilizations, BAR International Series 728, Oxford, 1998 (ISBN 0-86054-916-X). 19. Baillie, M.G.L., "Hints that Cometary Debris played some Role in several Tree-Ring Dated Environmental Downturns in the Bronze Age", Ref.18, pgs.109-117. 20. Peiser, B.J., “Evidence for a Global Disaster in the Late 3rd Millennium BC”, Ref.18, pgs.117-140. 21. Courty, M.A., "The Soil Record of an Exceptional Event at 4000 BP in the Middle East", Ref.18, pgs.93- 109. 22. Clube, S.V.M., and Napier, W.M., The Cosmic Serpent, Faber and Faber, London, 1982. 23. Clube, S.V.M., and Napier, W.M., The Cosmic Winter, Blackwell, Oxford, 1990. 24. Joseph, F., Survivors of Atlantis, Their Impact on World Culture, Bear & Co., Vermont, 2004 (ISBN 1-59143-0-040-2). 25. Baillie, M., Exodus to Arthur, Catastrophic Encounters with Comets, BT Batsford Ltd., London, 1999 (ISBN 0-7134-8681-3). 27. De Jonge, R.M., "The Brandenburg Stone, Comet Catastrophe of 536/540 AD" (560 AD, Battletown, Meade County, Kentucky) (2010), Ref.5, to be published. 28. De Jonge, R.M., "About the Brandenburg Stone (560 AD, Battletown, Meade County, Kentucky)" (2010), Ref.5, to be published. 29. De Jonge, R.M., "Ikom and the Dardanus Flood (c.1159 BC, Cross River State, Nigeria)" (2010), Ref.5, to be published. 30. De Jonge, R.M., “Great Serpent Mound (c.2300 BC, Adams County, Ohio)” (2010), Ref.5, to be published. 31. De Jonge, R.M., “Northern Crossing, Biblical and Dardanus Flood, (Reykjavic, Iceland, c.770 BC)”, Ref.5, to be published. 32. De Jonge, R.M., "The Myths of Monks Mound (Cahokia, Illinois, 650-1400 AD)" (2010), Ref.5, to be published. 33. De Jonge, R.M., "Cahokia, Capital of Ancient America" (2010), Ref.5, to be published. 34. De Jonge, R.M., “Peters Creek Mound (c.715 BC, Clairton, Pennsylvania)” (2010), Ref.5, to be published. 35. De Jonge, R.M., “Four Ancient Stories (Poverty Point, NE Louisiana, c.700 BC)” (2009), Ref.5, to be published. 36. De Jonge, R.M., “Megaliths of Arrowhead Region I (Minnesota, c.1900 BC)” (2012), Ref.5, to be published. 37. De Jonge, R.M., “Megaliths of Arrowhead Region II (Minnesota, c.1900 and c.770 BC BC)” (2012), Ref.5, to be published. 38. Fell, B., America BC, Pocket Books, Simon & Schuster, 1994 (ISBN 0-671-67974-0). 39. Bailey, J., Sailing to Paradise, Simon & Schuster, 1994 (ISBN 0-684-81297-5). 40. Thompson, G., American Discovery, Misty Isles Press, Seattle, 1994 (ISBN 0-9612990-4-4). 41. Susan English, Yahoo Group: “Ancient Waterways Society”. 42. Robin Mueller, FB Group: "Old Copper Complex and Ancient Waterways America". 43. De Jonge, R.M., “Grave Creek Mound (I) (Moundville, Marshall County, WV)” (2012), Ref.5, to be published. 44. De Jonge, R.M., “Grave Creek Mound (II) (c.720 BC, Moundville, Marshall County, WV)” (2012), Ref.5, to be published.